d.	Reference Number: Cignal Account Number (click here to know your account number). Note: If customer has an existing account with UnionBank and would prefer to pay via Debit-to-account, fill out the Account number field in the upper right hand potion of the form. 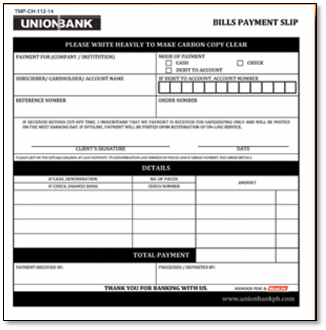 Present Payment Slip to the UnionBank teller together with cash/check payment. Once validated, UnionBank Teller will give subscriber/subscriber representative a validated copy.